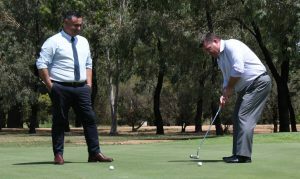 Local and visiting golfers will soon benefit from the single biggest funding boost in the Dubbo Golf Club’s history. Deputy Premier John Bariloro visited the club for the second time in less than six months to present $1.3 million to upgrade the on-course irrigation, and a further $300,000 for a lift in the club house. “This is the single biggest investment that’s been made in this club for decades – if not ever,” DGC president Niall McNicol said. Wednesday’s announcement was timely, with the club to host the Women’s NSW Open of Golf in 2020. The event, which attracts world ranking points as an ALPG Tour-sanctioned event, is estimated expected to bring 100 players from 30 countries to Dubbo. The 2018 event in Coffs Harbour saw up to $2 million injected into that city’s economy, and generated almost $3 million worth of media exposure across the globe. “It will help us achieve our goals in presenting the 2020 NSW Ladies Open golf tournament and, not only that, but it’s a legacy that will benefit Dubbo and the surrounding district for many years to come,” McNicol added. Barilaro also highlighted the need for a lift in the club house. “Improved access for those with disability is important today, and the inclusion of a new lift for the club [is fantastic],” Barilaro said. The deputy premier visited Dubbo in August last year to announce the golf club would play host to the Women’s NSW Open. “It is important that we match that with funding for the infrastructure, so when those golfers get here, they have a first class experience,” he said. Barilaro said Wednesday’s funding was “money in the bank” regardless of the result of the state election on March 23. With the club’s water allocation slashed by about 50 per cent in light of the drought, and the management in discussion with Dubbo Regional Council to secure more, McNicol said the state government funding announced on Wednesday would give the club a new lease on life. “We’ve got probably the best beer garden in Australia, to be honest,” McNicol said. “With the golf club’s outlook, and when it’s green and looking as good as it is at the moment, it’s fantastic. McNicol thanked Barilaro for the funding, as well as Dubbo MP Troy Grant, electorate officer Ben Walker and Nationals candidate for Dubbo Dugald Saunders for their advocacy. The Women’s NSW Open is one of four major tournaments held by Golf NSW each year, with prize money in excess of $150,000. Dubbo is set to host the event – the first of its kind in western NSW – in March 2020.